Data packet, "3 Sept. 2195 A.D./C.E. or 1 T.G.E." While our surviving battle groups head into deep space, here is a look back at recent events. Humanity has suffered a terrible blow, but we will survive and remember. Earth will again be our homeworld, no matter how long it takes. Note: All dates are as of 2195 A.D./C.E. (or “1 Terran Galactic Era”) [8 August 2013]. August 18: Long-range scouts confirm the presence of enemy forces within 10 parsecs of the Sol system. Political tensions lead to open armed conflict on Earth and in the Mars Confederacy. Aug. 20: The Bloody Flag and other Gustrall warships come to assist Terra and its colonies, joining Olvar and Trinoid advisors. Kraythor and “Takers” seize power on Ru’okkal. Aug. 23: “Lt.Cmdr. Sebastian Growlick” takes the frigate Crazy Horse into the armada, using zero-point devices and nuclear weapons to destroy two capital ships and about a dozen smaller vessels in the Wolf 359 system. Aug. 24: The first wave of the Zarkonian Armada attacks Camp Alpha, the U.S.N. outpost at Alpha Centauri. The Lionheart battle group is lost. Zurmiz Krott/Harbingers of the Righteous Order of Submission attack outer colonies. Raptor II and Hurricane class fighter squadrons scramble, as mecha units engage kaiju in Europa and Earth’s oceans. Aug. 25 — The Battle of Saturn: The Zarkonian Armada arrives in the Sol system and destroys the Saladin battle group near Saturn. The carriers Achilles and Shaka Zulu are heavily damaged near the Jovian Commonwealth and retreat with refugee fleets. Martial law is declared. The P.T.S. Venture returns with materiel and a Nethian rapid-deployment force before picking up passengers from Mars. Aug. 26: The Simon Bolivar is scuttled, as Terran forces inflict some casualties on the armada but are badly outnumbered. The Ano Wasu and George S. Patton groups pick up some survivors and come under heavy fire. Joan of Arc, King Arthur, and other mythological figures are supposedly seen in battle. Aug. 27: The Ilokar and Miyamoto Musashi provide cover as ships leave Earth and Mars, and the Shiva takes heavy damage. Nuclear weapons detonate on Earth; millions killed. Planetary defenses in the inner Sol system fracture. Aug. 28: Surviving Terran battle groups leave the Sol system. Zantor Probscine claims control of Earth in the name of the Zarkonian Imperium. Venusian Finance Union surrenders and joins Encegulan trade guild. Aug. 29: Ground forces on Mars and Earth resist Zarkonian troops. More atomic weapons detonate; orbital habitats seized or destroyed. Kharvamid Alliance formally admits Terrans, though many prefer neutrality. Aug. 30: Ilokar and other Terran battle groups no longer able to communicate directly with the Sol system. About 5 million free Terrans mourn, joining Aquarian, Laransan, and Ma’ari refugees. Aug. 31: The Achilles heads toward Algol 364-B, a Gustrall-controlled system, while the Ilokar and Venture head to Oasis Station. Former members of “Full Circle” take the Geronimo, Vengeance, and Spring Wasabi into nonaligned space. Sept. 1: The Blackbird, Dauntless, Sovereign, and Tigress catch up with the Firebrand, a slower-than-light science vessel. The Pina Colada heads toward Van Maanen’s Star…. Sept. 2: The Ano Wasu, George S. Patton, Miyamoto Musashi, Shaka Zulu, and Shiva call for elections to colonial council. Emergency repairs made to all ships. Sept. 3: Zarkonian Sax class fighters break off initial pursuit of fleeing ships, which scatter spinward and rimward into deep space (toward Kharvamid worlds). 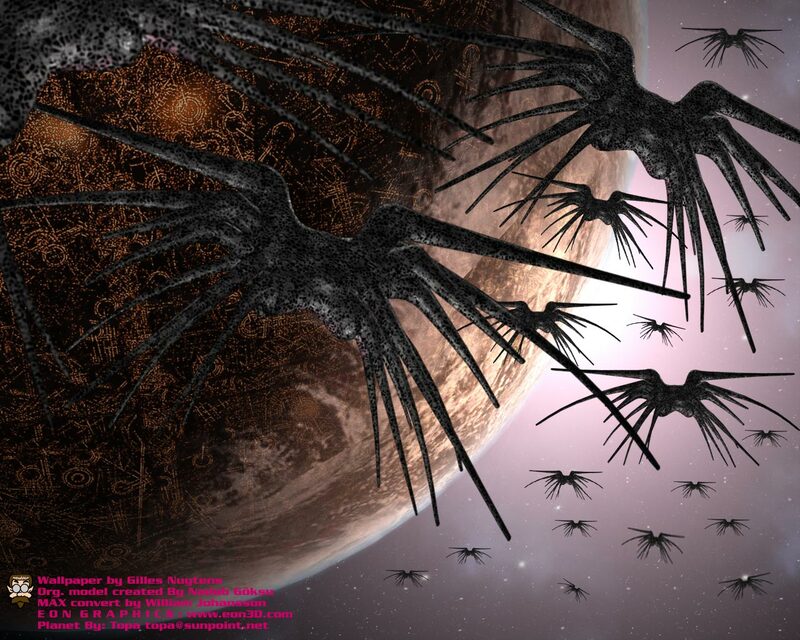 Part of “Terra’s Pride” heads for the Nova Aquarius, a megacorp colony ship….